Raw feeding is naturally best for your dog, and it has never been easier to give your dog the kind of food it was intended to eat. A dog needs a balanced combination of meat, bones and organs from three different animals to be healthy. Do you have any questions or concerns? We’ll help you get comfortable with raw! 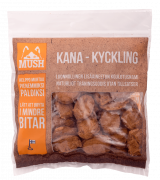 You can always reach us at info@mushbarf.fi. 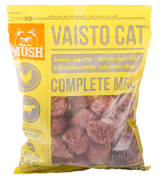 To help make raw feeding easier, we made the user-friendly Vaisto series for you. In the past, you had to know quite a bit about raw, and you had to get different ingredients and mix them yourself. As a solution we created Vaisto (eng. INSTINCT). 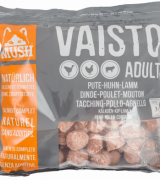 Every Vaisto product consists of three different animals and is balanced with some vegetables and oils to meet all your dogs nutritional requirements in the most natural way. The ingredients come from local farmers that we trust. The products are 100 % natural and you won’t find additives, preservatives or grains in our dog food. The prodcuts are raw-frozen. This way the natural nutrients are preserved as well as possible in our products. Every meal contains meat, bones and organs from three different animals, which gives your dog a variety of different protein sources. You no longer need to think about what to feed your dog earlier in the week. All our meals are nutritionally complete including balanced amount of meat, bones, organs and vegetables. It’s easy to serve the products because they come in bite sized portions of 25 gram each. It’s easy to count how much dog food you should give because every package includes 30 bite sized portions of 25 gram each. If your dog needs 100 gram, you just give 4 bite sized portions. ​GET IT, MELT IT, FEED IT! Well, you don’t have to worry about where to start. We have made the products easy-to-use for you, so you don’t necessarily need to have any previous knowledge about how to feed your dog raw. 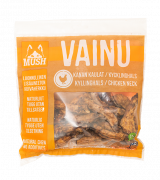 Our MUSH Vaisto® meals include meat, bones and organs from three different animals and are suitable for all dog breeds. 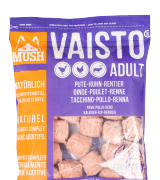 If your dog’s diet consist of only MUSH Vaisto® meals you don’t have to give the dog any additional bones. 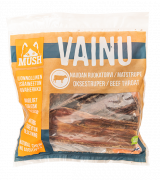 The dog gets all the amount of bones it needs from the Vaisto products, but if you want to give your dog something to chew on, a bone is a perfect match for the dog. 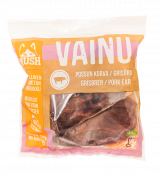 We’ve made a special product for those of you who have never given your dog raw before. 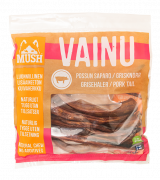 MUSH Vaisto® GREEN is made especially for dogs that are switching from dry food to raw, or for dogs that have a slower metabolism. When switching from dry food to raw, one must take into consideration that the dog is not used to raw food. This is why Vaisto GREEN contains less bone, plenty of rumen with good enzymes and bacteria that promote digestion when shifting to a new diet, and a few more vegetables to keep stool consistency normal. 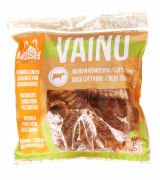 You should use this product for two to four weeks prior to starting the other Vaisto products. If you have a puppy, we have developed a product for puppies that are still growing in height. 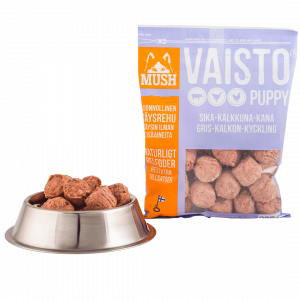 Our Vaisto products labeled with PUPPY FORMULA are meant for puppies that are still growing in height. The products contain a slightly higher percentage of bones so that the puppy gets all the nutrients it needs to build a strong skeleton. There are also a few more vegetables in the products so the stool will not be too hard, and so that the dog is kept slender as it still grows in height. The rest of the nutrients (meat, organs and oil) give your puppy the proteins, vitamins, fatty acids and other essential nutrients it needs. The product should be used for the whole time that the puppy is growing in height. 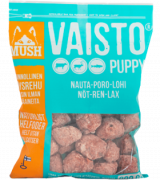 When the dog has grown to its full height, it is time to move to the other Vaisto products. 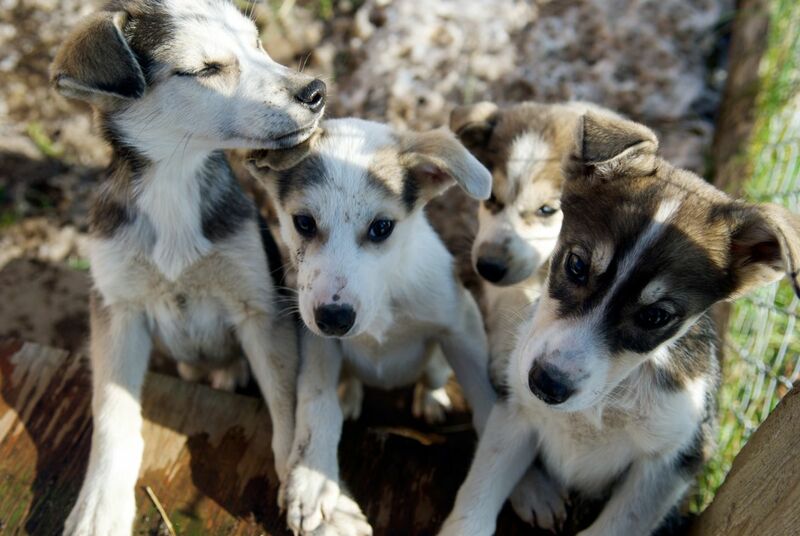 Remember, that dogs are individuals and grow in their own pace. For this reason it is important to observe the growth of your dog and react if need be by increasing or decreasing the food amount so that the puppy remains appropriately slim and in good shape during its growth time. 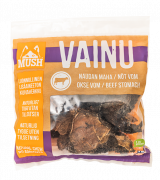 DO I HAVE TO ADD SOMETHING TO MUSH VAISTO? No, you don’t have to add anything. 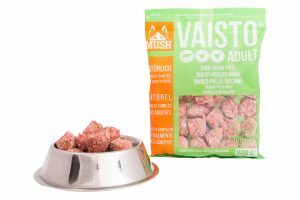 The Vaisto-diet imitates nature’s way of providing everything a dog needs. 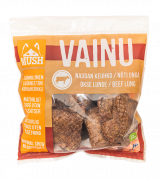 Vaisto is a complete raw meal, which includes raw meat, bones, organs and a small amount of vegetables. This means that the product contains all nutrients that are important for your dog. Dogs are still individuals, and therefore it’s important to follow your dog’s health, and maybe add something if you find it necessary. HOW MUCH raw FOOD SHOULD I GIVE MY DOG? An adult dog should be fed 2–5 % its own weight in raw food. A recommendable amount for an adult dog is 2,5 %. Every dog is unique and the optimal feeding amount depends on factors like age, activity, metabolism and environment. Pay attention to your dog’s health regularly. If your dog looks too skinny, give it more food. If your dog is overweight, give it less food. 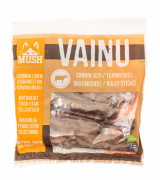 If it’s hard to find a suitable meal size for your dog, contact our customer service team at info@mushbarf.fi. 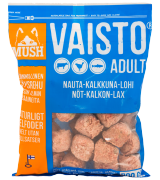 A good guideline is to give your dog the same amount of Vaisto meatballs as it’s weight in kg. 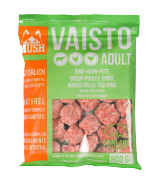 A 10 kg dog would consume daily 10 meatballs or about 1 Vaisto mini block. Very small dogs tend to eat a little more. For example a 5 kg dog might need 6 or 7 meatballs to keep its ideal weight. Very large dogs seem to need a little less – a 40 kg dog might only need to consume 30 to 35 meatballs daily. It’s recommendable that one should feed an adult dog once a day because this is what is natural for them. In the wild, dogs eats one large meal daily and then they fast. Some dogs can be very fussy, or even refuse to eat altogether if they get food too often. If your dog is used to eating more often than once a day, you can continue the same way without having to worry about the dog’s well-being. WHAT IF MY DOG REFUSES TO EAT RAW? It’s nothing to worry about, it takes a while to get used to something new. It´s completely normal that a dog reacts negatively when you switch from dry food to raw, since it is not used to getting such nutritious food. It’s not uncommon that in the beginning a dog vomits pieces of bone that it hasn’t been able to digest. It is also normal that it might get stomach problems when you start with raw. These symptoms usually end within a week, but sometimes it might take two weeks before a dog gets used to the new food. Any questions? We are eager to help! Please contact us at info@mushbarf.fi.